Where should the top of #1 piston be when the timing marks are lined up? I would think it should be on TDC but mine isn't and the compression is only 25PSI. Piston will be down in the bore about 3/4". The reason for this is, the crank gear key and mark is in line with the #1 crank pin but with the cam offset the pin is pointed to the right (or left when viewed from the front) several degrees to align the mark on the crank with the mark on the cam gears. Thanks for the reply James. That is exactly what I have. This engine was rebuilt some time ago and the insides look great. It is bored 060 over with new aluminum pistons and appears to have had a valve job also however, I only have 25 PSI on all four cylinders and it doesn't run for crap. Always have to use starting fluid to get it to run for even a minute. It has the vaporizer carb and new timer system up front. It's very frustrating considering I was an auto mech for many years! Being an auto mechanic on modern iron (after 1928) has no place in the repair and operation of a Model T, it is a bird of another color. First, have you checked the timing and set it at 15 degrees ATDC? If this is set correctly start the engine with the timing lever all the way up. Once the engine starts, advance the timing lever 1/2 to 2/3 way down to run. This should help with the run and may explain why you don't have any power. Another think you might consider is taking the vaporizer carb off, stepping back and throwing it as far as you can. Then installing a Holley NH. Yes, I have tried everything to keep it running but nothing seems to work. About the only place the engine will even start is 2/3 down. I used the tool to set the commentator distance and bent the rod to make it right. Isn't 25PSI way to low to even run? How much can be milled off the head without causing any issues? 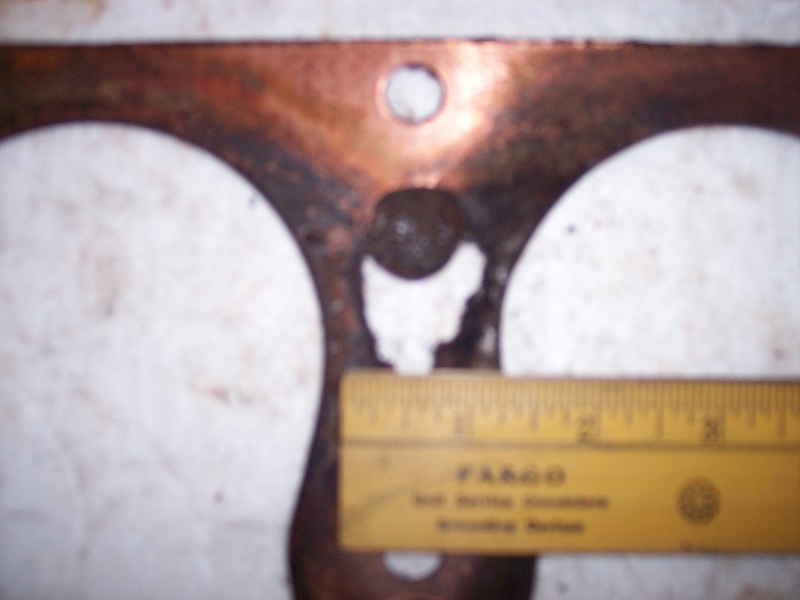 The head appears to have the original milling marks on it. I love that idea Dave! What has to be done to install the NH carb? A T motor will still run with two hundred thousands milled off, but may eventually crack. When you are checking your compression be sure that the carb is WIDE OPEN and all spark plugs OUT. 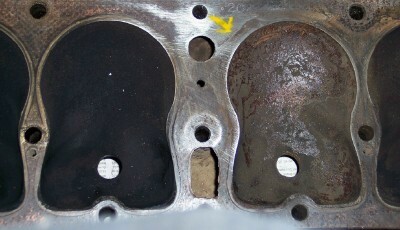 I would like to show you what a head gasket and a head look like when they blow. This head if I can get a picture to show had two hundred thousands off of it and forty thousands off the black for over a 1.4 inch. I also had a friend that had two hundred off of his head and blew it. I now only take one hundred thousands off a head. I'll start from the beginning. I disassembled the complete carb and cleaned it all. I got all four coils working and sparking as they should. I put a new commentator assembly on it. The better one with the metal seal and no carbon tip. I got it running and it ran poorly for about 10 minutes then just quit. I have recleaned the carb hoping I had missed something but that did nothing. I have checked the timing of the spark 6 times but still nothing. When it does run it's only sporadic and won't speed up or smooth out. I've checked the compression 3 or 4 times with the same results each time. It's a beautiful little car but I'm ready to push it out in the street! Also, the timer gauge tool does not work with any timer other than the stock ford roller timer. To set the timing remove the #1 spark plug. Hook the wire back up to the plug and lay the plug against the head. Bring the piston up to TDC of the compression stroke then turn the engine slowly until the piston just barely begins to move down. Now remove the timer rod. Turn the ignition switch on to battery and rotate the timer counter clockwise until the #1 coil stops buzzing. Turn the timer slowly clockwise just until the coil starts to buzz again. Bend the rod so that it will go through the tab on the top of the timer with the spark lever all the way up and double check that the timing is correct. Unless you rebuilt your coils and adjusted them on a strobo spark or HCCT your engine is never going to run right. Finally do not attempt to start the engine with the spark lever in any position other than fully retarded. If the engine should back fire your starter or arm can be severely damaged. Thanks for the info Stephen. I did exactly what you said prior to removing the head and one piston. I wanted to check the rings myself to be sure. Do I still need to have the coils adjusted on a strobe spark or HCCT? How and where do I get them tested? I guess I am more confused now than I was! I have enough spark to knock a horse down and they fire exactly when they should. The valves look good and all open and close when they should. And yes, 25PSI is very low that's why I pulled the head in the first place assuming the old girl needed rings but they look brand new. And 060 over is quite a bit. I checked the ring gap in the cylinder and it is perfect. The only thing I have found for certain was two of the ring gaps were lined up when they should be 1/3 way around from each other. That little tool for setting the timer works only for the original timers, so, use the method Stephen described, then try again. Vaporizers are sometimes tough. Check for a local club and try to find a local T guy where you can borrow an intake and exhaust manifold and a Holley NH, or a working Vaporizer. Roger, if there is nothing wrong with the valves or rings the only other thing I can think of is maybe the intake manifold is partially plugged up with something. Yes, the coils must be properly rebuilt and adjusted. 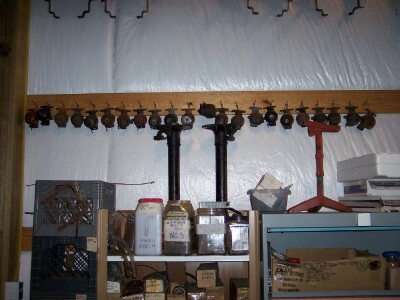 Do a Google or a forum search for coil rebuilding and you will find several forum members who can rebuild your coils. I believe you mentioned in another thread that you removed the timing gear cover. If you did remove the cover did you align the cover when you re-installed it? There is a special alignment tool that fits in the cover and over the camshaft to insure proper alignment of the cover. If is not centered the timer rotor will touch the contacts at different times causing cylinder to cylinder timing differences and sometimes rough running. This is the proper tool to use. http://www.modeltford.com/item/3221KRW.aspx There is a cheaper alignment tool but, it is essentially useless because it fits in the felt seal area of the cover which can vary widly in size and is not very accurate. The cover not being in alignment will not cause a huge problem but it's just another thing to think about. I'm sure though your main issue with the engine running so poorly has to do with the low compression. If your coils are all firing, they will probably work OK on battery. If they have not been adjusted on the HCCT or Strobospark, they probably will NOT work real well on mag. If you just want them adjusted and keep your same points and condenser, I'll do them for you, if you pay the shipping. However, if they have the original condensers, they should probably be completely rebuilt. I, or many others out there can do that for you, as well. If you are running on battery right now and your coils are all firing, I doubt they are your primary problem, but once you get your primary problem taken care of, your coils may be something you want to look into to make it run better. I had a similar problem. but my engine would run poorly and overheat. You had to have the spark advance all the way down to get it to run. I found that the timer was set with the gauge correctly but I had a new day timer. It was way off. When I did a piston position setting of the timer the car started good and ran fair at lower speed.(rpm). So I removed the head and checked everything. The valves were slightly burnt but still should have been OK. Pistons and rings looked new and were .030 over. Head gasket was OK. I decided to do a valve job and hand lap the valves. I also decided to change to adjustable lifters while I was there. The lifter and valve guides were almost perfect. about .001 wear on each. When I removed the cam I found the real trouble. The front cam bearing was loose in the block. The bearing fit the cam perfect but the bearing shell was loose .020 in the block. My valve clearances were aprox .012 and .015. When the engine is running slow everything is probably OK at the valve clearance area. but at higher rpms the cam gear will "climb" up the crank gear and since the bearing shell was loose .020 that would give me a negative .005 to .008 for a valve clearance and be holding the valves open. I have never seen this discussed before but I have found it 2 times on cars I own. Yours may be OK but is worth a check if you have the cover off. You may need to remove the front cam bearing set bolt to get the cam gear to move easily when checking. You may want to check the exhaust also. Sometimes mice or ?? will plug them up.